In another move that shows how television has truly taken over poker, Harrah’s announced on Thursday that they will be changing the $50k HORSE Tournament to an 8-Game Mix that will feature a final table of exclusively No Limit Texas Holdem –I know you must be as shocked as I am *sarcasm*. The move comes on the heels of ESPN dropping the HORSE tournament from its television schedule during the 2009 WSOP as they made the move to broadcast only No Limit Holdem events. Perhaps because it was removed from the television schedule the tournament saw a dramatic decline in attendance –the tournament had drawn close to 150 entrants the previous year, but managed only 95 in 2009. 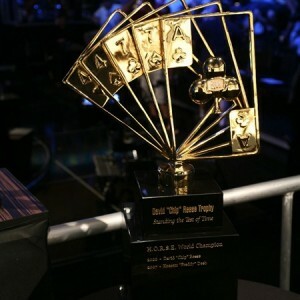 The HORSE Tournament has taken on special meaning since it was renamed in honor of poker legend David “Chip” Reese who passed away in 2007, and was the inaugural champion of the event. Reese was considered by many as one of the greatest all-around poker players in the history of the game. This entry was posted on Friday, December 18th, 2009 at 4:58 am and is filed under Poker News. You can follow any responses to this entry through the RSS 2.0 feed. You can leave a response, or trackback from your own site.